CM Magazine: Sister Anne's Hands. Marybeth Lorbiecki. Illustrated by K. Wendy Popp. New York, NY: Dial Books for Young Readers (Distributed in Canada by McClelland & Stewart), 1998. 40 pp, cloth, $22.95. ISBN 0-8037-2038-6. When she reached out to touch my cheek, I dodged her hand as if it were hot. It was puppy brown with white lacy moons for nails. And palm side up, it was pink with dark lines. A light pretty pink like an evening dress for Barbie. I tried not to stare. She didn't seem to notice. "Welcome to the second grade. I'm Sister Anne." 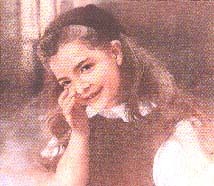 This story is narrated by Anna, a seven-year-old girl in second grade in a parochial school in the United States in the early 1960s. Sister Anne is an African American, the "new" teacher in town. Some of the parents take their children out of the school, and some children also show signs of rejecting the nun. 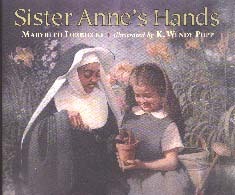 Anna and her classmates learn how these actions hurt Sister Anne as she teaches them about the injustices of racial intolerance. Sister Anne is a wonderful teacher and opens new doors to the children during her year with them. Both funny and poignant, the story is based on a childhood experience of the author. However, one wonders how relevant this book will be to today's Canadian second graders. Will they understand the message being brought from the 1960s? The M & S press release describes the book as "an inspired tribute to the teachers who change our lives," but it may be that this story would be better suited as a novel for older children rather than as a picture book for under-eights. Marybeth Lorbiecki has won several prizes for her previous books such as Just One Flick of a Finger. The art work, rendered in pastels, is wonderful. Wendy Popp used authentic toys and clothes to bring the early '60's settings to life. Her children are appealing and real looking. She has illustrated several previous picture books. Luella Sumner, formerly the Librarian of the Red Rock Public Library in Red Rock, ON, is now retired.